A detailed description of the issue you have encountered. It is also important that you describe how we can reproduce the issue, if you are able to reproduce it. If applicable, the full name(s) of the vehicle(s) affected. If applicable, the difficulty setting (e.g. Arcade) in which the issue occurs. If applicable, an attached screenshot showing the issue, as well the client replay file and the server replay. Attach the Client Log of the session in which the error occurred. If the problem is persistent, attach the latest one available. Currently DM33 does not have it's correct performance, not only are the penetration values wrong, but it also uses the wrong slope modifier. 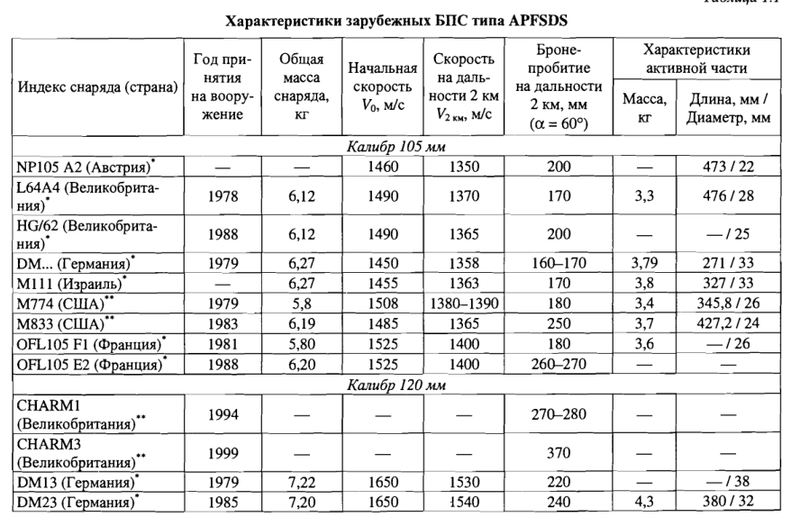 Page 5 and 6 of the APFSDS document. 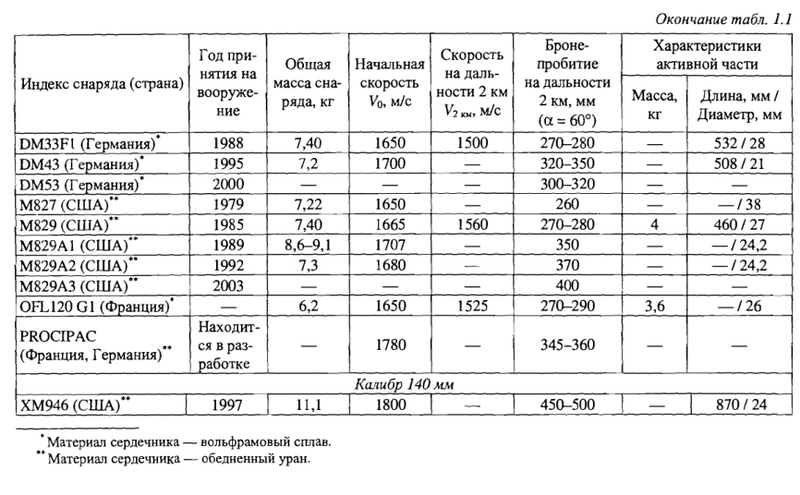 As you can see most of these reports agree that the penetration should be around 240-280mm at 2000m and 60°. 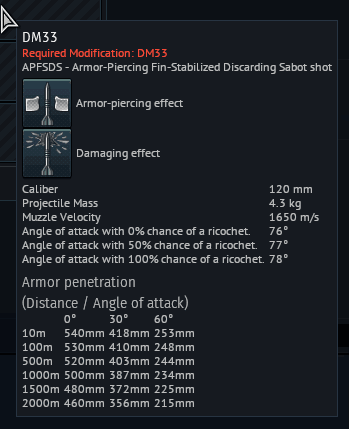 To conclude: the DM33 should get the long rod modifier and get the penetration changed from 215mm at 2000m and 60° to 250mm at 2000m and 60°. Because it is a long rod however, the penetration at 100m and 0° should either be the 60° value doubled or lower than that. Thanks for your report. I'll investigate this issue. This is incorrect. 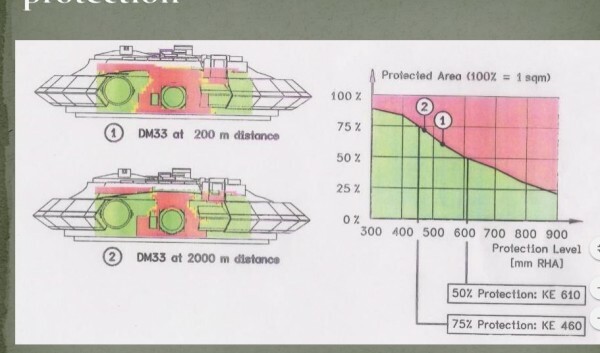 The document is saying that 50% of the turret in question has equivalent protection to at least 610mm of RHA. The penetration of DM33 at 200 meters is indicated by the circled "1" on the graph, and is somewhere in the range of ~520-530mm. Likewise, it's saying that 75% of the turret in question has equivalent protection to at least 460mm of RHA. The penetration of DM33 at 2000 meters is indicated by the circled "2" on the graph, and is ~470mm. Keep in mind that the Russian estimates listed shouldn't really be used as they often are very far off, the abysmal performance estimate of the DM53 on the Russian chart where it's actually listed as worse than the earlier DM43 should be enough proof of this. Regardless of this any estimate, Russian or not, frankly can't ever replace actual figures such as those from the swedish trials, which due to the nature of the report has to be taken as the actual performance of the round. If you were a historian you would actually have to go by these figures as they are bound to be the most reliable / accurate, seeing as they are from actual trials. Such data trumps any estimate any day, and to be frank Gaijin litterally has to use these if they don't want to be accused of abandoning realism in favor of artificial balance to what'ever side they see fit. It's as simple as that really. These figures btw fall directly inline with the figures used in SB for the DM33. It seems you're right in this regard. @Conraireran DM33 through the Lanz-Odermatt equation, and got similar results. Why doesn't devs use lanz-odermatt equation as the primary source for penetration values? It seems to be correct everytime and only differ with minimal values from sources. That seems correct, looking at it this is how I read it too. And like Lanz Odermatt predicts 470mm at 2 km is akin to 270-280 at 60 deg for the long rod penetrator. And again these figures are as accurate a figure as we're going to get on the matter until something more "official" is posted, i.e. Gaijin pretty much has to use these. because details critical to the completion of all variables in the lanz -odermatt equation would be classified in some munitions to especially include that of most Abrams APFSDS DU munitions. Unless somebody has a source that makes a fool out of me of course. Because Lanz-Odermatt is only able to calculate a very limited set of APFSDS penetrators. Monohlitic rods to be precice. The DM33 is for example the only true monohlitic design in the array of german darts. Actually there's an equation for Sheathed Rods too. DM23 and DM33 are monolithic. Most of the US DU apfsds is monolithic as well. You still have oddball designs like dm13 and M735 though. Interests:Anything that can make stuff go "BOOM", "THUNK", "CLANK" or "CAPOW"
Sent to me by an anonymous source. It is from a polish ministry of defense research paper on penetration characteristics of monolithic APFSDS-T penetrators. EDIT: Added translated tables for the most relevant charts. I would like to point out that the excerpt from the swedish trials is part of a LEAKED document that has NOT been declassified and therefore as per gaijins guidelines can not be used as a source. I don't know where you got this from. As far as I'm aware, such a guideline doesn't exist. Care to provide me with a link to this guideline? I don't really think that's true since they clearly used swedish documents to model the armor on the Leopard 2A4, it is very similar if not almost identical to what the swedish documents said. The bug report has been submitted. This thread will remain unlocked for 7 days in order to allow anyone with information/examples or additional sources to post them. It will also serve as a place where the developers may post questions, so please keep up to date here.